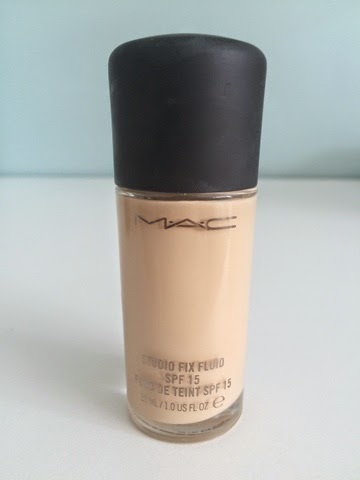 Hey guys so recently I purchased the Mac Studio Fix liquid foundation and loads of people on Twitter wanted a review on it so here it is! Before I start I use the shade NC15 which matches my skin tone really well! Some may say it's quite pricey and I agree as I've only ever used drug store foundation around the price of £8 but after many recommendations I decided to go for it and it's defiantly worth the price! I'm still without a pump as it just comes as a bottle with a lid which is kind of annoying but I've been told they give you one if you ask. When applying I put a small amount on the back of my hand as a little goes a long way and using the Real Techniques Foundation Brush and apply a streak to my forehead, nose and each cheek then using the Real Techniques Buffing Brush I blend it all in. I don't know if this will make sense but it's feels so silky putting it on! It's it really buildable and had a huge coverage; it covers my under eye circles, all my blemishes, redness and spots! After I applied it ,it didn't feel like I was wearing anything on my face! It doesn't go cakey which many of my past foundations have. Now the main reason I got this foundation was because its mattifying. I have oily skin so I usually have to touch up with powder through out the day and this ends up making my makeup look cakey and the first day I used this I didn't have to re apply any powder! I was so impressed! Overall, Mac Studio Fix is great if you have oily skin, has medium/high coverage and a little goes a long way! It also has SPF 15 so will be great for on holiday! Will defiantly be repurchasing!